Fall is in full swing, and so is my pumpkin obsession! At least for a couple more weeks…soon it will be all about peppermint and gingerbread! 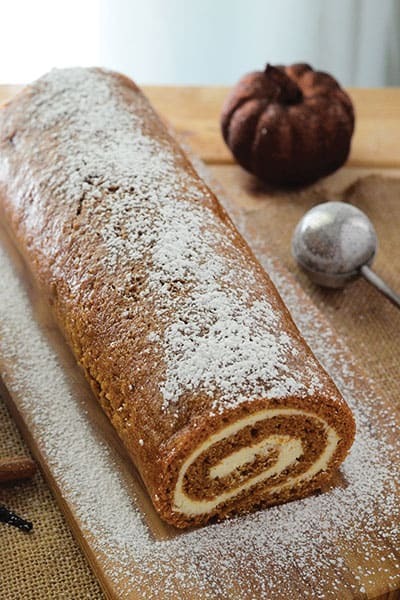 There’s nothing quite like a pumpkin roll on a chilly day, paired with a mug of hot cider or cocoa. It just brings people together! And believe it or not, these beautiful works of edible art are easier to create than you might think. 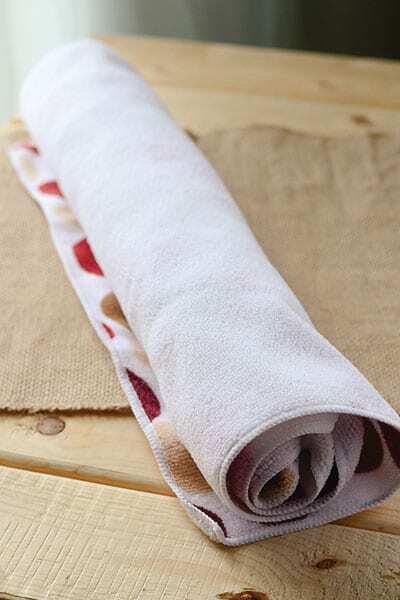 All you need is your ingredients, a jelly roll pan (baking sheet), a kitchen towel, and a gentle hand, and you can have one of these sitting pretty on your dinner table tonight! 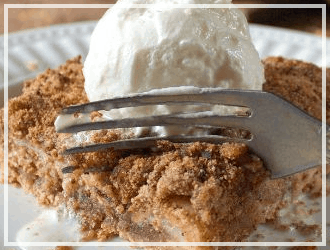 OR you can work ahead, and prep this for Thanksgiving – it’s a perfect freezer dessert! 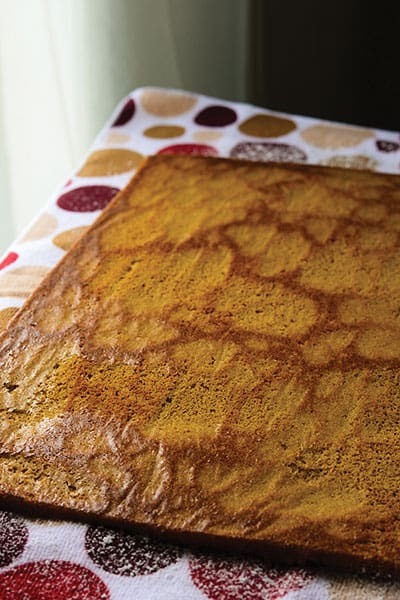 Start by turning all your sponge cake ingredients into a lovely light batter. 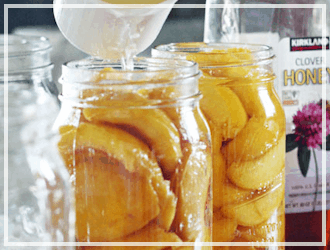 Prepare your jelly roll pan by spraying it with cooking spray, lining it with wax paper or parchment paper, then hitting it again with the spray. Carefully spread your vibrant batter in the pan and bake it for 12-16 minutes in a 375 degree oven. Find a clean kitchen towel and sprinkle it generously with powdered sugar. 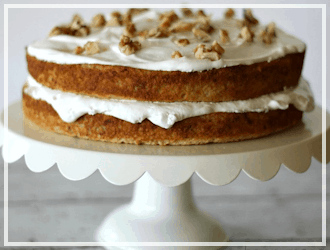 When your flat little cake is done, flip it onto the towel and peel off the paper. Gently, but tightly, roll it up inside the towel. 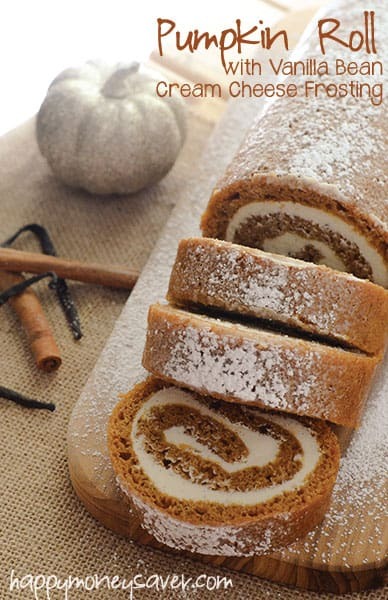 You’re teaching it how to be a pumpkin roll! Then let it cool all wrapped up in the towel for about an hour or two. Whip yourself up a batch of Vanilla Bean Cream Cheese Icing to fill it with…but try not to eat it all before it makes it inside! Believe me, it’s tougher than you think. It’s sooooo sinfully good, I couldn’t keep my fingers out of it. When the cake is cool, unroll it and fill it with an even layer of the icing, leaving a little space on the edge furthest from you. Then repeat the rolling you did the first time, but without the towel. 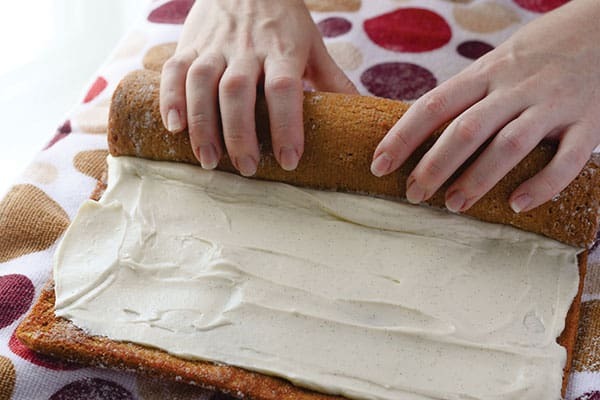 Be extra gentle on this step – if you roll it too tight, you’ll squeeze all the icing out, but if you roll it too loosely, it won’t be so pretty! Wrap it up in plastic wrap and chill it (or freeze it) until you’re ready to dig in. Top it off with a little powdered sugar fairy dust, and you’re good to go! Gorgeous, isn’t it?! 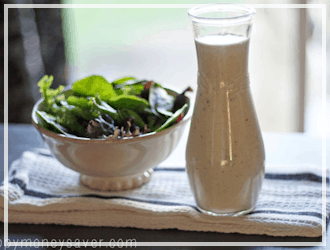 If you save any of my recipes, this is one of the ones you can’t miss!! 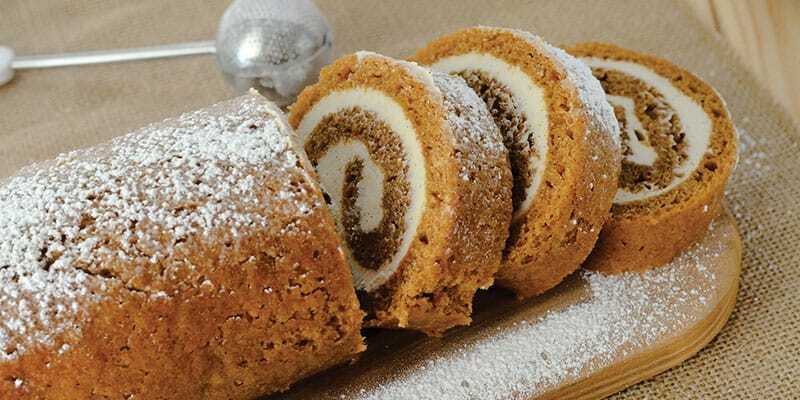 This easy pumpkin roll recipe, complete with vanilla bean cream cheese icing, is a perfect holiday dessert that can be prepared ahead of time and frozen! Preheat Oven to 375 degrees. 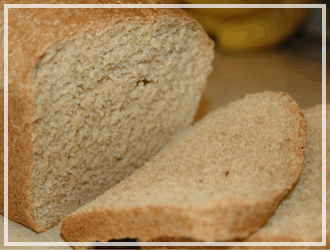 Use cooking spray to coat a jelly roll pan, cover with wax or parchment paper, and spray again, then lightly flour. 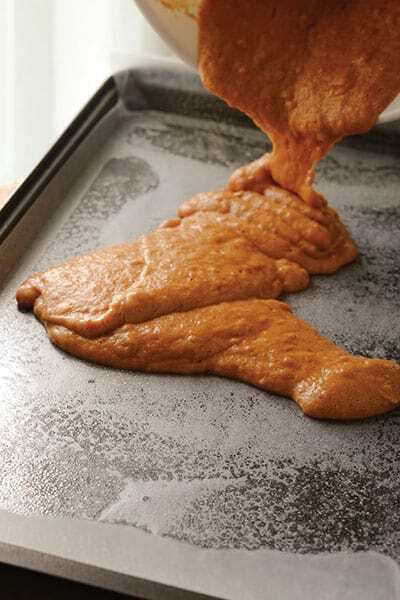 In an electric mixer whip together eggs and sugars until thick and creamy, add pumpkin puree. Add dry ingredients all at once, mix with paddle just until blended. Don't over mix. Spread evenly in prepared pan. Sprinkle on pecans, if desired. 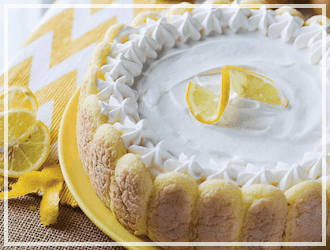 Bake for 12­-16 minutes, or until cake is springy and cooked through. While cake is baking, sprinkle a clean white kitchen towel with powdered sugar. When cake is done, immediately flip it onto your kitchen towel, roll it up with the towel, and leave to cool on a wire rack. 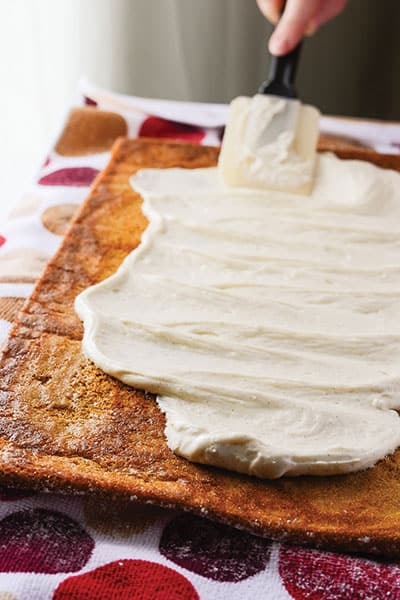 In an electric mixer, whip together cream cheese, butter, vanilla bean scrapings, and vanilla extract until well blended. Then, add powdered sugar and beat until smooth. Once cooled, unroll and carefully remove your cake from the kitchen towel. Spread filling evenly all over cake, leaving 1/2 inch unfrosted lengthwise. Once frosted, begin rolling, lengthwise, not too tight - you don't want to smoosh out the filling. Once rolled, wrap in plastic wrap and refrigerate at least 45 minutes before slicing and serving. OR: Double Wrap it with plastic wrap and then freeze it, using a cookie sheet to help keep its shape during the first few hours of freezing. 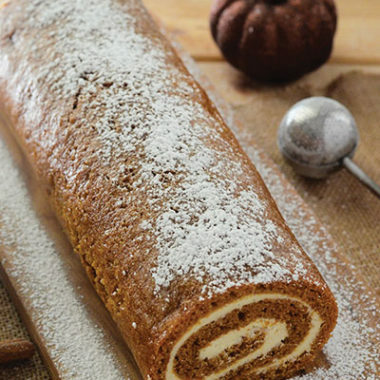 To Unfreeze and Serve Your Pumpkin Roll: Just move it from your freezer to your counter top for an hour or two. Unwrap, dust with powdered sugar, slice into 1 inch slices and serve! Crazy about pumpkin? 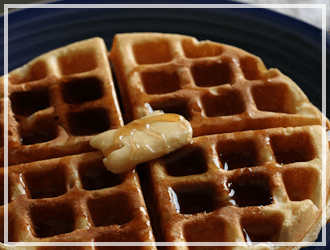 Here are a few more great recipes to help you get your fix! 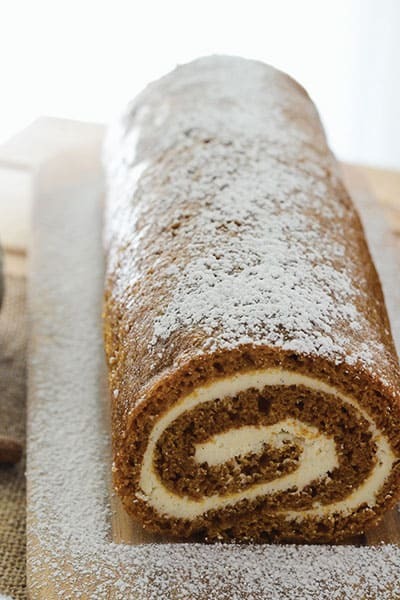 I just made The Freezer Pumpkin Roll with Vanilla Bean Cream Cheese Frosting Recipe and it was so easy to make ever! Thanks for sharing the recipe. I will definitely make it again! Love this!!! It looks delicioua! 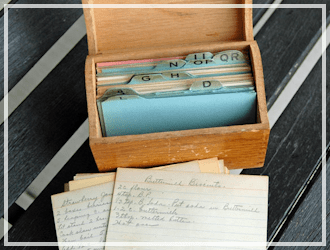 Also looks very professional, but seems achievable at the same time – love thise kind of recipes! Thank you so much for sharing!! Hi Karrie! I love your site! 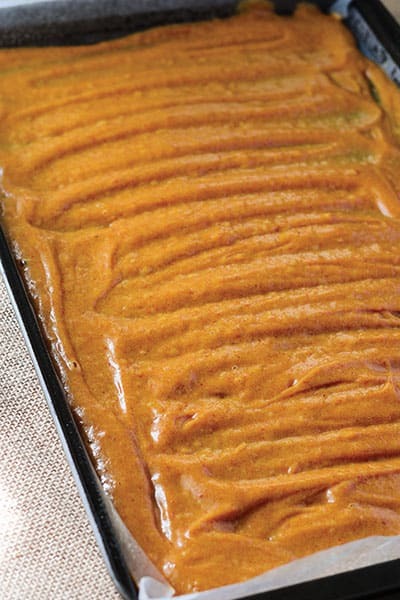 I am looking forward to making this for Thanksgiving, but the number for how much pumpkin puree is distorted on my computer. Could you tell me how much I’m supposed to use?